Peycho Kanev has been writing poetry for the past 10 years. His poems have appeared in more than 400 literary magazines, such as: Poetry Quarterly, Welter, The Shine Journal, Ann Arbor Review, The Catalonian Review, The Arava Review, Quill&Parchment, Midwest Literary Magazine,Nerve Cowboy, Chiron Review, Tonopah Review, Leaf Garden, Walnut Literary Review, 322 Review, Instanbul Literary Review, Mad Swirl, In Posse Review, Southern Ocean Review, The Houston Literary Review, The 13th Warrior Review, Mascara Literary Review, The Mayo Review, Windmills, The Aroostook Review, Naugatuck River Review and many others. His work is gathered in numerous print and online anthologies. He is nominated for the Pushcart Award and lives in Chicago. His collaborative collection “r”, containing poetry by him and Felino Soriano, as well as photography from Duane Locke and Edward Wells II was published in the spring of 2009 by Please Press. Also in 2009 his short story collection Walking Through Walls (Ciela), and in April 2010 his poetry collection American Notebooks (Ciela) both were published in Bulgaria. This poetry collection will draw you into such a rich and deep profound experience, that you will identify that experience as your own. Only the exceptional poets can do this. Peycho Kanev is exceptional - he is a magician. He turns words into living things. He makes the boundaries between poetry and reality disappear. He will transform you when you read this book. The poetry, can I say that I don’t care? just like the big boys during their time. and the God of the Word not Death. 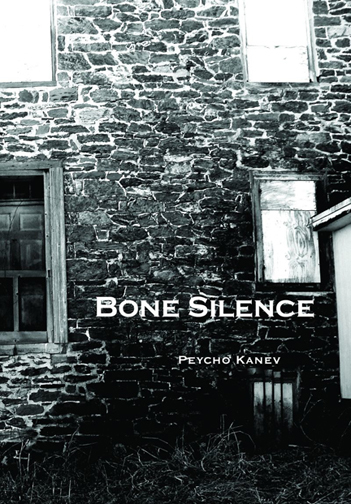 Peycho Kanev’s newest book of poetry called "Bone Silence" captivates from the very start. He employs many different poetic devices and forms. This book is filled with many thought provoking, dark and gritty sentiments. The narrative dialogue is blunt and unyielding. This is not a light hearted read of romanticized ear tickling, rather, it is cold realism. Bone Silence came across as a book of self review. A place in life at which youth and death walk tightropes across the conscious mind and collapses into ink and paper which carry the scent of cheap wine and cigarettes. The surreal and mind commandeering thoughts and imagery will leave you blinking the rose tint from your eyes. "Bone Silence" is a vital read to all who want to enjoy some cloudy sky poetry.